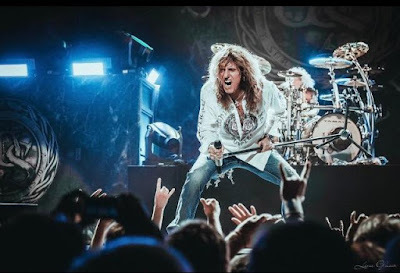 Frontman David Coverdale explains there was never any intention to compete against the original recordings. “The Purple Tour (Live)” will be available as CD/DVD and CD/Blu-ray sets, as well as double-LP, single CD, and digital versions. The double-disc collection also includes video footage of the concert mixed to 5.1 Surround Sound, plus band interviews, a new music video for “Burn”, and a number of bonus performances not available on the CD or vinyl versions. Whitesnake recently released a 30th anniversary reissue of their classic 1987 self-titled album, and are planning to issue a new studio record in 2018. The band will join Foreigner and Jason Bonham’s Led Zeppelin Evening for a newly-announced 2018 US summer tour that will begin in Bangor, ME on June 15.